Posted on January 30, 2015, in Week Two Discussion. Bookmark the permalink. 8 Comments. “In asmuch as you have done it to one of the least of these my brothers and sisters, you have done it to me.” – Big J.C. I think this is an age old question–if God is in everything then do I need to do anything? Practically it is pretty clear to me that we have free will and that there is evil in the world, thus my values say that it is important for me to care and heal our earth and environment. I believe we all have divinity within us including animals, plants, nature and man-made objects. But, sometimes are divinity is encased in a hard shell, shut off from us by hurt, anger, pain and a modern world that gives little time for care and reflection. In order to access our divinity we need see the divinity in everyone and everything including ourselves, we need unwrap that which keeps us from our soul and our divinity. Caring for creation is an important way for us to care for our soul and access our divinity. If we start with the premise that God is perfect and God is in everything, we must also remember that God (for the purpose of this discussion, the Judeo-Christian God) is eternal. Things — earth, Jupiter, stars, universes — existed before humans, and will continue to exist after humans. I think that in Genesis, God granted us an opportunity, a chance to be stewards of this beautiful planet. I also think it’s our choice whether we honor that responsibility. We can treat the earth with care, encourage others of faith to be “stewards of Creation,” tread lightly, eat mindfully, seek peace. Or, we can pollute the earth, fight each other in wars, and hate our neighbors. The way I see it, the only thing at stake is humankind (and the animal and plant species that share our earth in this period of time and are inherently affected by our actions). If humans destroy ourselves (created in the likeness of God) and our earth (God’s Creation that he granted us dominion over/responsibility for) God will still be here, because God is in everything. In God’s own actions, there is both creation and destruction. God teaches with both. God is both. In a very basic sense, I think as far as humans and their relationship with the earth is concerned, it’s a choice. No one is obligated to be a mindful human, but if we want to breathe clean air, grow and eat healthy food, have children, watch in awe at a sunset, we should choose to be stewards. I agree with Rabbi Fine that God is everywhere and God’s “signature” is found in all things (panentheism). I believe that all living beings are indeed perfect and have no choice but to do “God’s will” – EXCEPT humans. I believe we are indeed different from the lion who eats the gazelle, the racoon that “steals” an egg from my chicken house, or the oak tree that shades out other plants. When non-humans struggle for survival, I don’t believe they have the ability to do evil. Humans on the other hand have a choice….. we can live according to God’s will or not. When we choose to live according to God’s will….. we too are trying “to be perfect, as our Heavenly Father is perfect”. When we do otherwise, we “miss the mark” – we sin. Humans are the only species who have freedom of choice. I’m grateful to my friend Lee for sharing her experience with me of Wednesdays presentation by Rabbi Fine as I was sorry to have missed it. 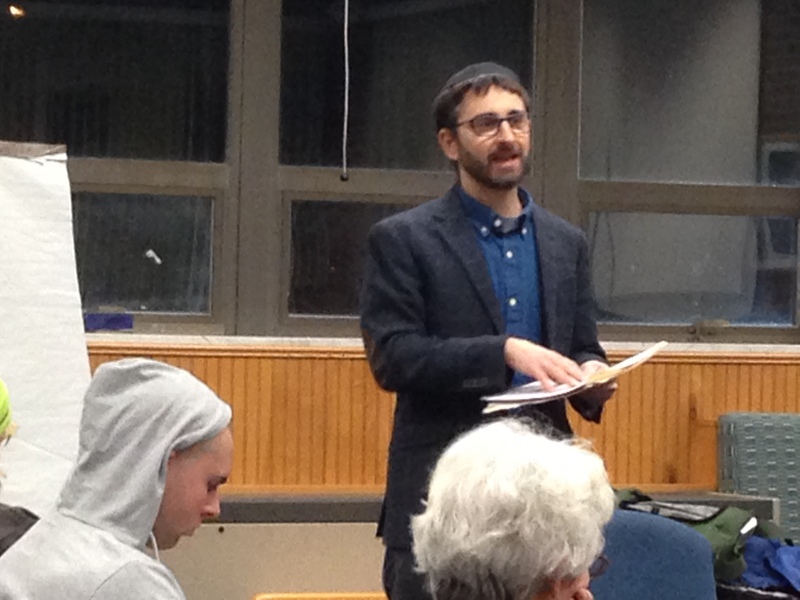 I particularly appreciated the urgency with which Rabbi Fine is calling us to act on behalf of our climate. It can be easy to abdicate responsibility to God, the divine all-knowing, and trust that all will be well. But as we attune ourselves toward action, we hear the call to act ever more clearly and urgently. I really enjoyed the class with Rabbi Fine. Everything that I am working on in school and in my personal life is geared towards reconnecting humanity with spirit– to heal the vehicle in which the soul resides, while healing the Earth. With my involvement of such things, I never hear enough the urgent message that Rabbi Fine expressed when talking about the ecological crisis. I too, believed that a spiritual awakening would be the solution to all problems, but indeed, there is not time for that. Those who have been awakened are blessed to be able to see today’s world in a different light. Although not everyone will come to an awakened state, it is important to act in a way that will clearly express the existential dance between the Divine, humans, and the Earth (all that is One). Yes, Creator is everywhere. We are equally as holy as the Earth we walk on, the air we breathe, and the creatures we live with. But, what is ‘Perfection’? This world was created and has maintained a perfect condition for life to thrive, but how long will that condition be maintained? What will come after humans? What came before humans? The conditions are perfectly imperfect, as are humans. Take for instance natural disasters (wildfires, hurricanes, tsunamis, etc.) In a fight for life over death, these disasters seem imperfect and evil because we are faced with the destructive forces. The Divine is in all of us, and the only thing for us to do is to be–to live in harmony with the home (Earth) that we were given, and to treat every living thing with an equal amount of love and respect. When humans don’t live in their ‘being-ness’, then imbalance forms. Creator has to do what it can to maintain balance. So I guess what I am getting at is that there is no “perfect”. We are beings of creation and have the ability to create beautiful things, for Creator is in us all. So to aid Creator, humans should just be, be with emotions, be in the present moment, be in harmony—to aid in the restoration of balance. I had another thought about Rabbi Fine’s presentation. He said at one point that he used to believe that we had to change people’s perspective (how they thought) before we were likely to see the social change necessary to ameliorate climate change but today he thinks we need to get to work and we don’t have the time to wait for folks to change the way they think. I understand the urgency, but I disagree. I believe that if we don’t see a significant mind shift in how we relate to the non-human natural world, any action we take is likely to either be ineffective or may actually cause more harm. Let me clarify the point I was trying to make. I CONTINUE to feel strongly that in order to establish a truly sustainable relationship between humanity and the rest of creation, the onus is on humanity to transform how we understand ourselves in relation to the rest of creation. For me, this has to do with consciousness and perception–and are thus spiritual challenges. I also CONTINUE to feel strongly that legislation, advocacy and the like, will not get us where we need to be and share John’s concern that, without the inner transformation, any work we endeavor to do may be either ineffective or worse. What HAS changed for me is that my sense of urgency around keeping carbon in the ground has led me to feel that we cannot afford (if we ever could) to wait for, or rely on, a global spiritual revolution of heightened earth consciousness. We need to plug away at the, ultimately more important, (and more difficult!) inner work that will result in a livable planet at the same time that we need to be protesting in the streets and doing whatever it takes to keep carbon in the ground. It can’t be an either/or. So, I guess if anything has shifted for me it is a (reluctant) concession that we don’t have the luxury to focus primarily on inner work. We need to meditate, legislate and demonstrate!